A tall, athletically put together tight end with a leaner frame, but has the ability to add more girth as he matures. Is natural sitting into his stance. Fires off the ball low and doesn’t waste any motion getting into his routes. Does a nice job exploding off the line and can get into his routes quickly. Is a good straight-line athlete when asked to run vertically down the field. However, it’s his savvy that really makes him a tough cover. Knows how to use a subtle head/shoulder fake in order to set up defenders and does a nice job changing gears as well. Accelerates quickly down the field, tracks the football well and is coordinated enough to adjust. Also, displays good fluidity and balance on his sharply breaking routes. Stems his route well, is sudden/quick footed in tight areas and displays burst out of his breaks. Does a nice job using his strong hands and long arms well in order to separate vs. defenders who want to get physical. Likes to use their momentum against them as he gets them off balance and accelerates toward space. Finds soft spots well underneath and isn’t afraid to work the middle of the field. Impression: An impressive pass catcher who can win both down the field and underneath vs. man coverage. Has the frame and flexibility to develop into a solid blocker as well and looks like a future starting caliber NFL TE. Weaknesses: Could add a few pounds, has the frame to do it though – Looks like he has a bit of a habit of checking defenders before securing the ball, led to a few drops – Some durability concerns, got dinged up and missed parts of multiple games. 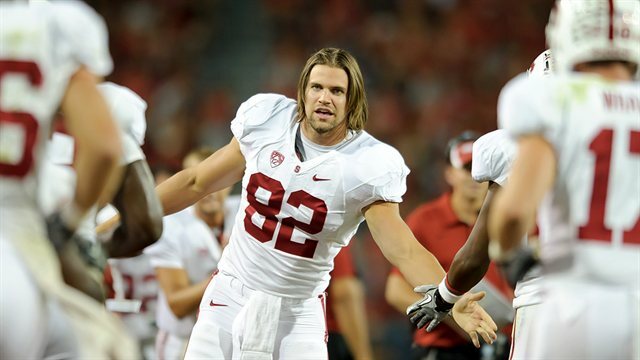 Stanford tight end Coby Fleener is one of the better receiving prospects at his position in this draft class. With a good mix of toughness and short area quickness, he’s poised to be one of the first tight ends selected in the 2012 NFL Draft. Fleener has a long frame and makes the most of it as a huge target on short and intermediate routes. Although he doesn’t possess great speed, his long strides get upfield in a hurry (especially if he catches a pass in stride). Very competitive, Fleener fights for yards after the catch and shows good discipline in his route running. An above average pass-catcher with good hands, he can pluck the ball with his hands away from his body. Not a natural bender as a run-blocker, Fleener will need to add more upper body strength to drive his man off the line or to simply seal the edge. He does a much better job blocking away from the trenches and can definitely dominate smaller corners and safeties on the outside. Fleener has the potential to have a long career as a serious red zone threat in the NFL. His excellent crisp footwork when route running will really carry him. Fleener projects as a late second round pick in the 2012 NFL Draft. Productive tight end who benefited from playing in a pro style offense with a pro style QB. Prototypical height. Tough. Holds onto balls. A decent blocker, but the Giants have Bear Pascoe for that. Will be a great red zone threat. Reminds me a lot of Kevin Boss. Can get up the seam. Isn’t super athletic but will make guys miss. I can see him already on fly route up the seam, or crossing route in the red zone. Will be tough to bring down. Not in the Rob Gronkowski mode, but is more of the typical tight end. Not super fast, but fast enough. Not the mismatch nightmare, but a better version of Jake Ballard. He’s an upgrade, for sure. 2nd round, I think, he should be available. I think he starts right away and makes an impact. Again, not Gronkowski more like Boss. Which is plenty effective. No. Not a better ballard. He can’t block. Blocking was ballards strength. This is the guy I want to see them target, I just HATE his name, but when he’s catching sixes I won’t mind as much.